Creating an application that would easily convert MHT files to PDF would be a useful solution for those who deal with information from the Internet. With MHT to PDF SDK like Total HTML ConverterX this task becomes simple even for inexperienced programmer, as it provides everything ready in the code. All you need to do is to make simple adjustments for integrating the script into your existing code. These measures will help to secure the information in PDF copies from loss or damage. All the options of MHT PDF server converter are specified via command line parameters. If a user runs the converter in standard version, a conversion request should be sent to the application on a web server. All conversion settings should be listed in the command. If you develop a user interface, all convert MHT to PDF command line parameters are set via graphic shell, that makes it more comfortable for a user. 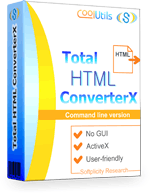 Make Total HTML ConverterX a code base for your own conversion tools, and this will make your apps highly functional for converting MHT files. Get the SDK here.